Whether your significant other asked you to marry them on a whim with a string of twine or spent years saving up for the perfect ring and planning the perfect proposal, the moment you get engaged is one of the most magical moments of your life. After you say “yes” it’s so exciting to finally start planning the wedding of your dreams — choosing your bridal party, finding the perfect Hialeah wedding venue, and shopping for “the dress.” But, have you ever stopped and wondered where these popular wedding traditions came from? Why we have bridesmaids and groomsmen? Why brides wear a white dress and veil? If you are wondering, you’re in luck. 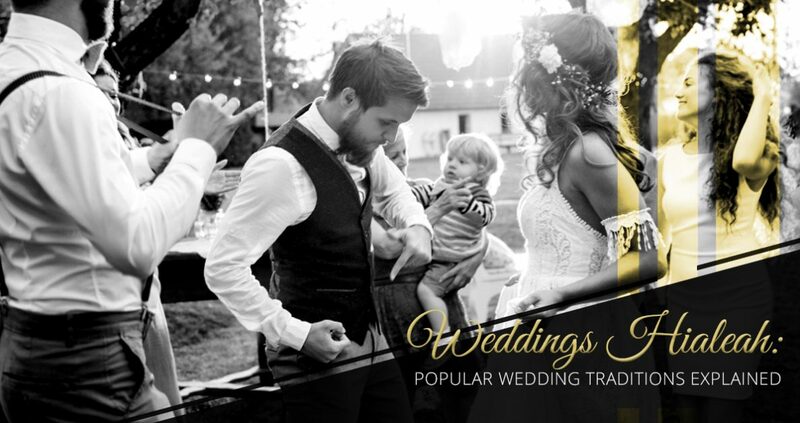 Today we are going to uncover the history behind these popular wedding traditions so you can gain a better understanding of where they came from. Have you ever wondered why wedding rings are worn on the fourth finger on the left hand? This tradition originated in ancient Rome and Egypt, and this finger was believed to have a vein that went directly to the heart. Back in the “olden days,” women chose their wedding dresses by choosing the nicest one they had in their closet, not from their nearest bridal shop. So where did the tradition of the white wedding dress come from? Queen Victoria! Her stunning white wedding gown popularized extravagant, white wedding gowns — which are still popular today. The origin of the veil comes from the culture of arranged marriages and superstition. In the case of arranged marriages, veils were used to hide the features of the bride so the groom wouldn’t back out of the marriage based on looks. It was also believed that the bride would attract evil spirits on her wedding day, so the veil was used to cover her face in order to protect her. There is evidence that this well-known English rhyme has been around since the Victorian era. It was believed that collecting these objects from loved ones to wear on their wedding day would bring about good fortune. While bridal parties today are great to help with decorating, cooking, cleaning up, etc., one of the main jobs of the bridal party back in more primitive times was to protect the bride from being kidnapped before they were wed. The bridal party even dressed similarly to the bride and groom to confuse the bride and groom’s true identity. We’ve all heard the saying, “Don’t see each other before the wedding, it’s bad luck!” This is an ancient tradition that exists for a similar reason as the veil — so the bride and groom didn’t have a chance to run before the wedding. Today, this tradition is becoming less and less popular with the rise of first look photos. Can you imagine someone intentionally ripping your wedding dress on your big day? Well, back in the 14th century it was considered good luck! As wedding gowns became more extravagant, throwing the bouquet and garter became popular. There are a lot of traditions around the wedding cake — from cutting it, feeding it to one another, and eating it one year later. But ultimately, the cake has been a symbol of good fortune in love, happiness, and fertility. In fact, the wedding cake was originally thrown at the bride and smashed over her head to promote fertility. 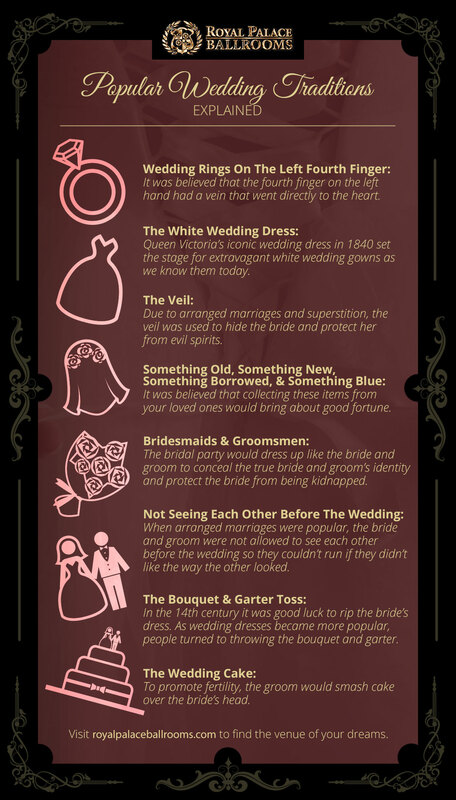 We hope you enjoyed this fun, mini history lesson behind some of the most popular wedding traditions. Who knew wedding history was so bizarre? Looking for the perfect event venue for Hialeah weddings? View our ballroom packages at Royal Palace Ballrooms today.